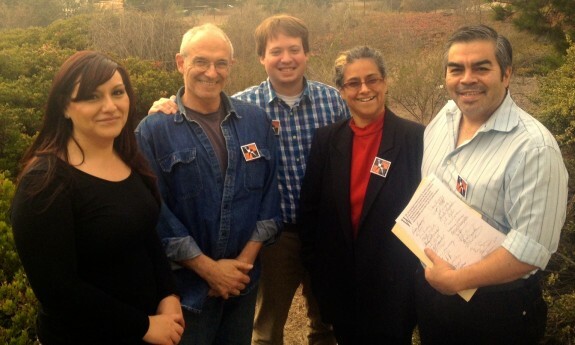 Guild members (l to r) Lucia Fernandez, Paul Hersh, Phillip Molnar, Claudia Melendez Salinas and James Herrera turned in the signatures to publisher Gary Omernick. Photo courtesy Guild member 2014. Guild members of the Monterey County Herald delivered a petition asking for a fair pay increase and a reasonable cap on what employees pay for health care to publisher Gary Omernick on Monday. The petition was signed by 38 employees, or 82 percent of guild members, and came from all departments: packaging, newsroom, circulation and advertising. The union has been extremely fired up lately, frustrated by company proposals that would freeze pay for 18 months and eliminate the cap on what employees pay for medical insurance. Members’ base pay has been frozen for more than three years, during which it was forced to take two week-long unpaid furloughs — a loss of roughly 4 percent of take-home pay. In the three years before that, base pay increased by 1 percent annually, but was offset by two week-long unpaid furloughs and an increase in the employee share of medical premiums. With the petition, the guild wants to show Mr. Omernick and Alden Global Capital how many Herald employees are committed to achieving a fair contract at the still-profitable newspaper. The company recently announced it would lay off five copy editors in favor of outsourcing the work to low-wage, non-union jobs in Chico, Calif. The Herald employees believe the Monterey County community deserves an excellent newspaper edited, reported and designed by local workers — not an operation continually beset by layoffs at the discretion of a Manhattan finance officer. With this petition, the Guild hopes Mr. Omernick will take to heart its proposal for 3-percent raises each year for the next three years, health care premium costs capped at 34 percent, and severance pay of two weeks’ pay per year of total service up to 30 weeks. Negotiations with the company continue Friday.